When you create groups in your audience, subscribed contacts can categorize themselves based on common interests or preferences. Sometimes, you may want to move subscribers into groups yourself. You can then use group data to send targeted campaigns. In this article, you'll learn how to add subscribers to groups. Make sure you understand how groups work in Mailchimp. To learn more, check out Getting Started with Groups. Groups work best if you need your subscribed contacts to self-categorize when they sign up for your emails or update their profiles. For internal audience organization, consider using tags instead. If you import a subscriber who’s already in your audience, you’ll have the option to update their group selections. The new import will overwrite existing information for that subscriber, but will not remove them from any groups they are already a member of. To add an individual subscriber to one or more groups, follow these steps. Enter the contact’s name or email address and click the search icon. Find the contact you want to work with and click View Profile. In the Groups section of the contact’s profile, click Edit. Choose which groups to add the contact to, and click Save. Nice job. 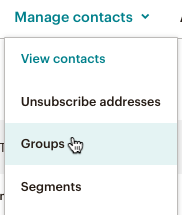 After you add your subscriber to one or more groups, you’ll be able to see these group selections in the contact table. You can pick and choose multiple subscribers to add to a group, or add an entire segment of subscribers to a group at once. To select multiple subscribers and add them to a group, follow these steps. Check the box next to each subscriber you want to move into a specific group. Click the Actions drop-down menu and choose Add to Group. After you click confirm, you’ll be able to see these group selections in the contact table. To add members of a segment to a specific group, follow these steps. 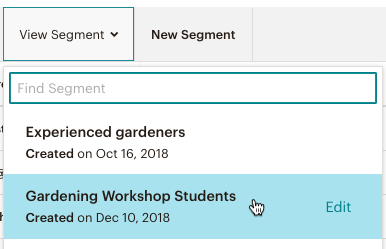 Click View Segment and choose the segment you want to work with. Click the arrow above the checkboxes and choose Select Visible. Depending on the segment size, you may need to click the next arrow and repeat this step until all segment contacts are selected. More drop-down menus will appear. First choose the group category, and then the group name. You can import new subscribers into groups, or use our import tool to update group data for existing subscribers. There are a couple of different ways to import subscribers to groups, depending on whether you want to import everyone in your file to the same group, or to different groups. To import subscribers to the same group, follow these steps. Click the Manage contacts drop-down and choose Groups. Find the group category you want to work with and click View Groups. Find the group you want to import subscribers into, and click Import. Follow the steps to import your contacts to Mailchimp. After you finish your import, we'll display a progress status message and email you when your import is complete. To import subscribers to different groups in your audience, follow these steps. Before you import, open the spreadsheet file containing the contacts you’d like to add to Mailchimp. 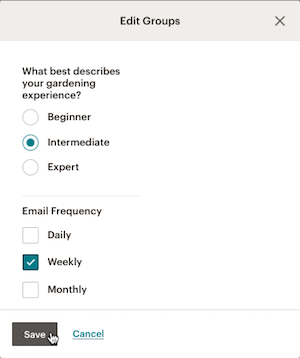 Create a new column for each group category, exactly as it appears in your Mailchimp audience. In the cells under each group category, enter the group names for each subscriber. To add a subscriber to multiple groups, separate the group names with a comma. When you're done, import your file to Mailchimp. In the field matching step, make sure the group column in your file is matched to the group column in your audience. We’ll handle the rest.